Next to the drum, the most important Native American instrument is the flute. Ironically, because Native American flute construction was significantly different than the construction of African, Asian or European flutes, it is now very difficult to find a flute that was carved by an actual American Indian person. 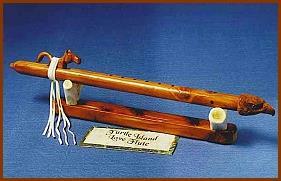 The reason for this is that "Native American flute" is now the accurate musical term for a wooden duct flute with a block whistle mechanism, so any such flutes, even if they were made in Korea, can technically be sold as Native American flutes-- just like Spanish guitars that were made in Cleveland Ohio are still called "Spanish guitars." You have to look for the "made in Spain" label to find a guitar that is authentically from Spain, and you have to find an unambiguous statement that a flute carver is a Native American artist to find a flute that is authentically Native American. (The IACA seal on the seller's website is an effective guarantee that you're buying a Native American flute from Native America, rather than a flute in the same style from someplace else.) Unfortunately, truly Native American flute carvers are few and far between. 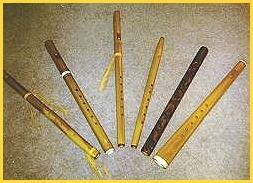 Most wooden flutes in the Native American style today are made by white or Asian people. Unlike other artists, they are not legally barred from marketing their work as "Native American flute carving" even though they are non-native, so they have effectively taken over the market. Flute carving is a very good example of exactly why the Indian Arts and Crafts Act is so important--if not for this law, all Native American arts and crafts would be going this route, and you wouldn't be able to find authentic Indian art anywhere off-reservation. If you are looking to buy a Native American wood flute that was actually made by Native Americans-- either because it's important to you to have the real thing or because you want to support native people with your purchase--then here is our list of American Indian artists whose flutes are available online. Currently this list is small because we know of very few genuinely Native flute makers. Please do contact us if you have a website of Native flutes for us to add. We gladly advertise any native artist or native-owned art business here free of charge, however on this page, due to the lack of accountability in Native American flute making under the Indian Arts and Crafts Act, we cannot link to your site unless it either has an IACA seal on it or the artist is directly stated on the website to be a member of a Native American tribe. On our main site we do our best to avoid slowing down our page loading with graphics, but this page is about art, so we'd really be remiss in not showing a few representative flute pictures. All photos are the property of their respective artists; please visit their sites to see their work in more depth. This Mi'kmaq carver makes traditional Woodland Indian flutes of sumac, lightning-struck cedar, and sweetgrass. Southwestern style Native American flutes made by a Navajo flute-carver. He also takes custom orders using a variety of woods, carving different animals for the flute block and cap, and so on. Another excellent Navajo carver offering pine and cedar flutes for sale. Handcrafted Native American wood flutes from a Kickapoo carver. Traditional Iroquois Indian flute bags made from fringed deerskin. Southwest style Native Indian flutes from Navajo flute-maker Andrew Begay. Iroquois Indian-made flutes in cedar and rivercane. He also carves separate animal totems for flute caps. Here are a few good albums of Native American flute music if you'd like to hear Indian people play these flutes! Navajo-Ute musician Carlos Nakai is probably the best-known modern Indian flute player. This Lakota artist is Pinny's favorite flutist--despite the title, this is very traditional native flute music. Delicate and haunting Native American flute songs by Aleut-Seminole musician Mary Youngblood. Impressive debut album by a Taos Pueblo artist, fusing traditional Southwest Indian flute music with bluesy folk rock. A good antidote for anyone tired of "new age" style Native American flute music. 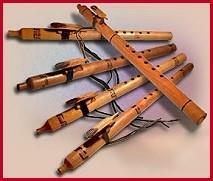 Carlos Nakai's history and culture of the American Indian flute, also with playing instructions and Indian flute songs. Guide for students of the American Indian flute, also with traditional historical and flute-building information. Beautifully illustrated version of the Sioux legend about the origin of the Native American love flute. A traditional Apache fairytale about an Indian flutist and his true love. Anatomy of the Plains Flute: Technical description of how to make Native American flutes, with pictures and diagrams. Native American Musical Instruments: Explanation of different types and constuction of flutes, drums, and rattles in Native North America. Native North American Flutes and Drums: Online museum exhibit featuring photos of historic Indian instruments from various tribes. About us: This website belongs to Native Languages of the Americas, a non-profit organization dedicated to preserving and promoting endangered Native American languages. We are not artists ourselves, so if you are interested in buying some of the flutes featured on this page, please contact the artists directly. Though we have featured only Native American flutes identified with the name and tribal affiliation of each artist, we haven't called the tribal offices to check up on any of them, and we only know a few of them personally. We also don't guarantee any of their products. This is not an exhaustive list of American Indian flutes--if you would like us to add your Native Indian flute site to this page, please contact us with your URL and tribal affiliation. We advertise any individual native artist or native-owned art business here free of charge. We do not link to Native American-style flutes which are not made by tribally recognized American Indian, Inuit, or First Nations artists, so please do not ask us to. And finally, websites do occasionally expire and change hands, so use your common sense and this general rule of thumb: if the creator of each individual artwork is not identified by name and specific tribe, you are probably not looking at a genuine Native American Indian flute.